The Anti-Terrorist Law will be 20 years old on 12 April. It quickly became a weapon that could be used relentlessly against journalists who dare to broach the problem of minorities. This month’s trials have offered further examples of the appalling and insane way it is used to imposesevere sentences on both writers and editors. Ibrahim Cesmecioglu, the editor of the newspaper Birgün, and Hakan Tahmaz, one of its columnists, were convicted of “reproducing a statement or communiqué by a terrorist organization” under article 6 of the Anti-Terrorist Law for an August 2008 article headlined “A unilateral ceasefire would increase the problem.” It quoted Murat Karayilan, a representative of the outlawed Kurdistan Workers Party (PKK), who was interviewed in Qandil, in Iraqi Kurdistan. Citing article 10 of the European Convention of Human Rights, the prosecutor ended up urging their acquittal on the grounds that they had exercised their right to cover a newsworthy subject. But the Istanbul court’s presiding judge nonetheless sentenced Tahmaz to 10 months in prison for writing the article and Cesmecioglu to a fine of 16,600 Turkish lira (1,600 euros) for publishing it. 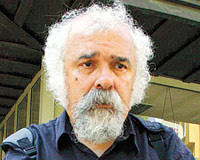 The same court convicted Mehmet Güler, the author of a book entitled “The global state and the stateless Kurds” that was published in May 2010, and his publisher, Ragip Zarakolu, on 10 March on a charge of “PKK propaganda,” sentencing Güler to 18 months in prison and Zarakolu to a fine of 16,600 Turkish lira (1,600 euros). In this case again, the prosecutor had described a prison sentence as “disproportionate and contrary to the requirements of a democratic society.” Their conviction was an example of judicial persecution inasmuch as both men were already convicted on the same charge in connection with another book in June 2010. The journalist Ertugrul Mavioglu has meanwhile been charged with “PKK propaganda” for an interview with Karayilan published in three instalments in the newspaper Radikal from 28 to 30 October 2010. The case is due to be tried soon and its similarity with the Tahmaz and Cesmecioglu case suggests he will also be convicted. The charge carries a maximum sentence of seven years in prison. After expressing a readiness to make concessions to the Kurds in 2009, the authorities seem to be reverting to a hard line in the Kurdish issue. The modest political opening seems to have had no impact on the way the courts treat journalists. There was another example of indiscriminate repression at Newroz, the Kurdish New Year that is celebrated in the east of the country with demonstrations. On the night of 21 March, Necip Capraz of the local newspaper Yüksekova Haber was detained along with 10 other people in the southeastern city of Hakkari on suspicion of membership of the Turkish Assembly of the Union of Kurdistan Communities (KCK/TM), which is allegedly linked to the PKK. Capraz underwent heart surgery a year ago and is in poor health. He was arrested exactly three years earlier after being the victim of violence while covering a pro-Kurdish demonstration. A well-known journalist in Turkey’s Kurdish southeast, he was awarded the Press Solidarity Prize in 2005 by the Association of Contemporary Journalists (CGD). For more on Kurds and freedom of expression, see the Bianet website, which does an excellent job documenting cases. For a more systematic treatment of the issue, see past post. For more on Guler and Zarakolu's book, click here.